Just too late to include in our last issue, but oozing with road racing nostalgia, the Mallory Bike Bonanza over the weekend of July 30/31 also celebrated 60 years of the famous Leicestershire circuit, and Old Bike Mart is indebted to Tony Page for these photos. 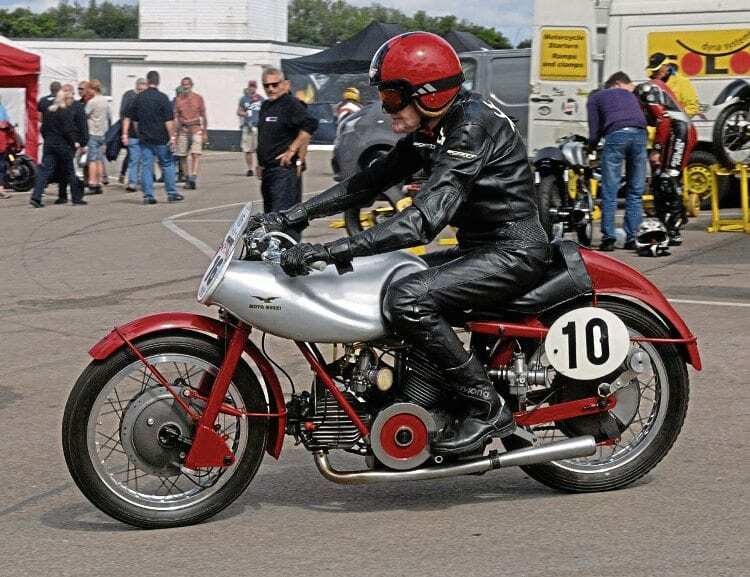 Sammy Miller prepares to demonstrate the 1951 120-degree V-twin Moto Guzzi Bicilindrici. Among those giving demonstration laps on historic race machines were Sammy Miller, who rode both a Moto Guzzi Bicilindrici and BMW Rennsport, Stan Woods on a Suzuki RG500, Norman White, who showed off his 1972 factory pannier tank John Player Norton, and Ron Chandler, who later took quite a nasty spill.